Food shopping can be one of the most enjoyable routine tasks of the week. Picking up fresh fruit and vegetables and new ingredients is invigorating; seeing the fridge bursting with colour and the shelves packed with the staples helps you stay inspired when cooking. I always look forward to restocking our kitchen and pantry with the essentials, adding in seasonal produce for variety. 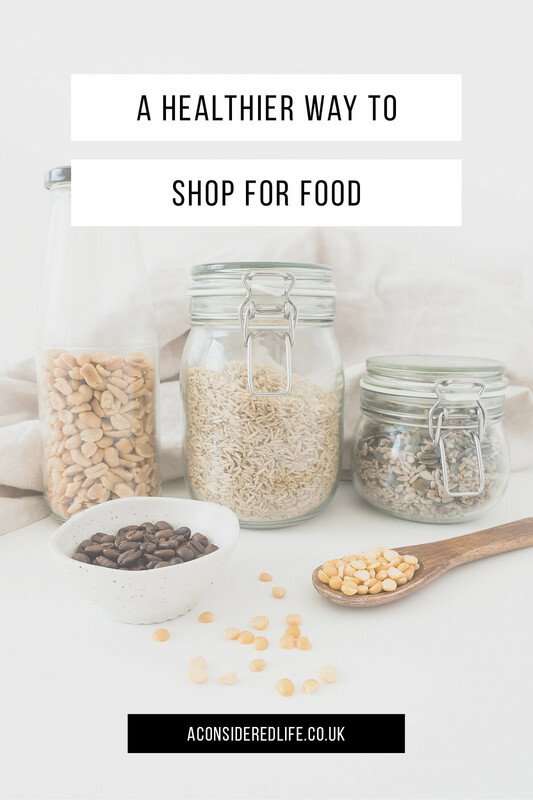 I’m often asked for tips on shopping for a plant-based diet so these are my five recommendations for a healthier food shop. Create meal plans. You’ll never stand in front of your open fridge wondering what to have for dinner again. Creating a shopping list based around specific dishes helps stock your kitchen and pantry with all the essential staples for your favourite meals and encourage you to try new ones. A little meal planning can help minimise food waste and increase variety in your diet. For our household food shop, we make sure we always include the staples for our favourite go-to recipes. This ensures we always have great meals to fall back on when looking for something to eat. I'm not keen on planning out every meal for the week but I do like to plan ahead for any new dishes I want to try. Every week I'll flip through the pages of my cookbooks for inspiration and add the extra ingredients to our shopping list. If you’re trying to build your confidence in the kitchen, want to eat healthier, or experiment with new ingredients; you don’t need to plan out every single meal. Writing down a list of staple weekly meals can be enough to provide guidance for your weekly shop. It means you’ll always have something nourishing and enjoyable to eat. If you have a strict food budget or want to save money and prevent waste, keeping an up-to-date shopping list and planning your weekly meals are crucial for thinking ahead and sticking to your budget. Always write a list. If you don’t you’re far more likely to make impulse purchases, repurchase items you don’t need, miss out items you do, and spend far more than you would have if you’d had a list to keep your spending in check. Having a list makes food shopping so much easier and quicker. A digital list you can access on your phone often works better than a written one. You’ll never leave the house without it and you can share the list with the rest of your household. It’s easy to add items and check things off, and because everyone responsible for the shopping has access, you’ll never end up doubling up on purchases. I use a shared Keep list for our household food shopping. It's easily accessible on both our phones and computers so we can add and remove any items we need. Having a shared list means we avoid doubling up on purchases and add ingredients we're running low on as and when we notice them. It's such a hassle-free way of track of our necessary essentials. Keep a running list. Add ingredients when you notice you’re running low. Before you go shopping, crosscheck the items on your list with what’s in your kitchen pantry to make sure you don’t miss anything and make a note of the quantities needed. Visit your local farmer’s market. You can pick up locally grown, seasonal produce in bigger quantities for less money than at supermarkets. There’s a real joy in buying produce straight from the people who grew it. You’ll learn where the stalls with the best produce are, and the more you visit the more you build a relationship with the traders often resulting in better deals. I do the bulk of our fresh food shopping at a local farmer's market. Although slightly less convenient than picking everything up from one big supermarket, it's a cheaper way to buy food. Produce costs far less, doesn't come wrapped in unnecessary plastic, and it's so much easier to eat seasonally. It feels good to support the community and eat locally grown produce. If you’re unable to find a local market, independent grocers can offer better produce than the big supermarkets although this can be reflected in the price. However, you’re paying a little extra to support your local businesses and in exchange receiving the freshest, best quality produce available. If you’re keen to avoid the excessive packaging and plastic wrap the big supermarkets love to cover their produce in; shopping at local grocers and farmer’s markets means you avoid it completely by bringing your own bags. Stock up on the essentials. If you’re able to, buying in bulk can save you serious money. 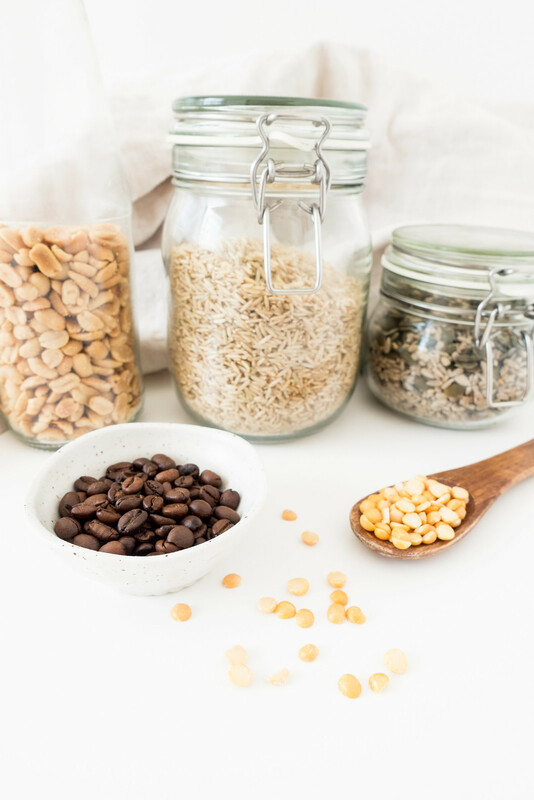 Things like legumes, lentils, rice, and beans - staples of the plant-based pantry - are well-worth purchasing in bulk quantities. Anything that is eaten on a daily basis, has a long-shelf life, and can be stored conveniently in the pantry, I purchase in bulk. Buying tiny packages of staple foods just doesn't make any sense, environmentally or financially, to me. 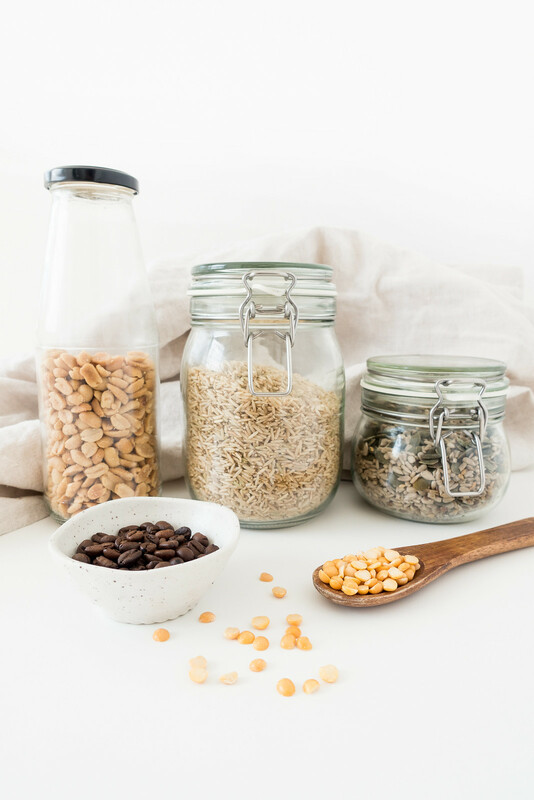 There are some everyday foods like rice, oats, and beans, that are worth taking up space in your kitchen because you know they're going to be eaten and if you store them in mason jars they look super pretty on the shelves. Look for bulk-buying co-operatives and outlets where you can pick up jumbo packages of food (and household) items to save on money and packaging. If you don’t have a local co-op or outfit, bulk-buying from supermarkets or online is still a cost-effective way of stocking your kitchen with staples. Bulk-buying can often be too costly for those on a tight budget so consider splitting the cost with family and friends. You can all save money on bulk-buying staple items without having to be out of pocket. Understand food labels. One of the healthiest habits you can adopt when it comes to food shopping is reading the ingredients list and understanding what it means. Since what we eat affects how we feel on a daily basis, being mindful of food labels helps us to observe what we're putting into our bodies so we can make better choices. I mostly avoid food with labels altogether. I find my body and my mind works better when I eliminate processed foods as much as possible. When you follow a plant-based diet or vegan lifestyle, it goes without saying you have to make reading the ingredients list a habit. Once you understand food labels it becomes a lot easier to avoid certain ingredients altogether. Food labelling can be tricky and misleading. Convenience food tends to be high in salt and sugar, and include artificial flavours and colours. Food manufacturers often use “healthier-sounding” ingredient names to trick consumers into thinking their products are healthier than they are. Look for recognisable ingredients; if you can’t pronounce or don’t recognise some of the ingredients, avoid purchasing the product. Choosing foods without labels should be a priority if you’re trying to adopt healthier eating habits. These foods tend to be whole foods that are naturally good for you, such as fruit, vegetables, grains, and legumes.